One of the most vital research paths in genetics is the relationship between genes and embryonic growth. Noninvasive, whole-body 3-D imaging of embryos is highly important for establishing these relationships in order to determine the impact of specific genes on development. Mice are a widespread research model in genetics, but capturing 3-D imagery of mouse fetal development requires higher resolution and higher throughput than conventional micro computed tomography (micro-CT) can provide. The advent of micro-CT was like the sudden acquisition of a superpower, allowing researchers to image the insides of objects and organisms noninvasively for the first time. The information gathered by micro-CT systems is compiled into slice-by-slice information, providing a look at any cross-section of a sample. Basically, the technology is an advanced X-ray transmission technique. A generator emits X-rays that travel through a sample and hit a detector on the opposite side. The sample is rotated and imaged by a fraction of degree repeatedly through 180 or 360 degrees, resulting in a complete 3-D radiograph. Researchers are constantly seeking to reduce acquisition times while increasing resolution in order to acquire imagery of in vivo processes that current technology is too slow to capture. An international collaborative of engineers and researchers now reports on the development of a laboratory-scale micro-CT system using a compact laser-plasma-based X-ray light source, which they used to scan a mouse embryo, a centimeter-scale target, at high resolution. They have reported their results in the Proceedings of the National Academy of Sciences. Plasma acceleration is a technique for accelerating charged particles using high-gradient plasma structures. In this case, the radiation was generated by the betatron motion of electrons inside a dilute, transient plasma, which overcame the limitations of previous micro-CT radiation sources using conventional solid or liquid anodes. "We show that with the laser-betatron source, we obtain embryo images of quality equivalent to that of the benchtop scanner but with a single laser pulse rather than the multi-second exposure required with the X-ray tube," the authors write. They report that their device has a higher photon energy than that used to demonstrate phase-contrast tomography of insect samples. They have increased the X-ray penetration depth and improved the signal-to-noise ratio, resulting in images of higher quality than those produced by commercial microfocus scanners. Producing such high-resolution, submicrometer-level details has been a major objective in micro-CT development, but the researchers emphasize that they'll need to continue refining their technology before it's ready for commercial production. One drawback is a lower X-ray to optical conversion efficiency, resulting in the necessity for multiple-shot exposures and longer scan times. Because of the low laser repetition rate, their scan of the mouse embryo took several hours. "This can be resolved by upgrading the laser system driving the accelerator," they write. But they believe their technique will result in compact X-ray sources for rapid imaging of soft biological samples with unprecedented resolution. In the field of X-ray microcomputed tomography (μCT) there is a growing need to reduce acquisition times at high spatial resolution (approximate micrometers) to facilitate in vivo and high-throughput operations. The state of the art represented by synchrotron light sources is not practical for certain applications, and therefore the development of high-brightness laboratory-scale sources is crucial. 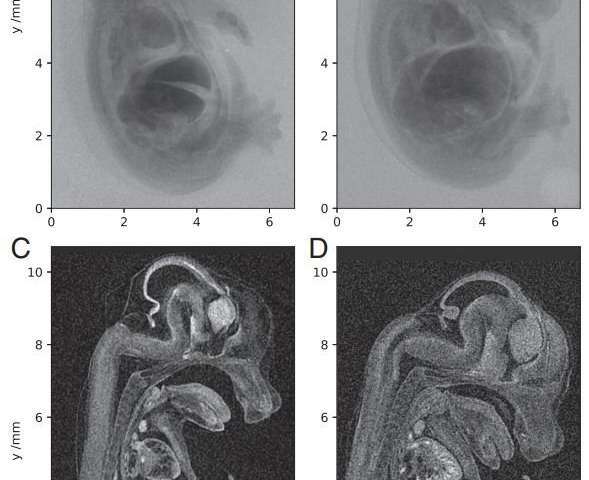 We present here imaging of a fixed embryonic mouse sample using a compact laser–plasma-based X-ray light source and compare the results to images obtained using a commercial X-ray μCT scanner. The radiation is generated by the betatron motion of electrons inside a dilute and transient plasma, which circumvents the flux limitations imposed by the solid or liquid anodes used in conventional electron-impact X-ray tubes. This X-ray source is pulsed (duration <30 fs), bright (>1010 photons per pulse), small (diameter <1 μm), and has a critical energy >15 keV. Stable X-ray performance enabled tomographic imaging of equivalent quality to that of the μCT scanner, an important confirmation of the suitability of the laser-driven source for applications. The X-ray flux achievable with this approach scales with the laser repetition rate without compromising the source size, which will allow the recording of high-resolution μCT scans in minutes.